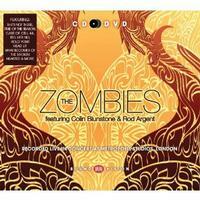 I’ve always liked The Zombies, so I looked forward to this live release. Well, I have to say, the album delivered. It’s a great live show from a band that produced some awesome music over the years. If the chance ever arises to see this group, take it. Until then, check out the live disc. This bouncy number just oozes cool. It’s catchy and fun and a great way to start the show off in style. There’s a killer keyboard solo in the middle of this and the vocal arrangement is awesome, too. There’s more of an old time rock and roll meets R & B or even gospel sound to this one. It’s a good tune, but not really my style. It’s not one of the stronger pieces here, but it does have a great vocal arrangement. While the bluesy sound that is the basis of this is also very much old-school, it’s more effective than the previous tune. The keyboards on this are awesome, but the whole song is great. This is actually one of the highlights of the set. Starting with a pretty hard rocking and rather pounding motif, this works out to a more melodic arrangement from there. It’s another strong cut with great instrumental and vocal arrangements. It works through several changes and is a pretty complex piece of music while still remaining accessible. There’s a lot of energy on this killer tune. In a lot of ways, this really qualifies as a progressive rock tune. Sure, it’s accessible and catchy, but it’s also got quite a complex arrangement with a lot of changes. It seems like after each killer tune they just get better. This one is going to be hard to top. It has such charm and even includes a tasty acoustic guitar solo. Keyboard based with a complex vocal arrangement, this is very much like the kind of music Queen often created, that old time sounding stuff. We’re back into bouncy pop rock, but again Queen’s a valid reference. Of course, that means (as it did on the last one) that The Zombies were probably a big influence on Queen since these guys came first. Although there’s certainly a lot of pop music in this, it’s another that could qualify as progressive rock pretty easily. More bouncy pop rock is heard on this tune. It’s fun, but really not one of the best pieces on show here. A slower cut, this one has some great organ and reminds me of Procol Harum quite a bit. There are also some bits here that make me think of Yes a bit. Higher energy, this is another bouncy cut and it’s definitely another that was probably an influence on Queen. In fact, at times it sounds so much like Queen that it’s rather scary. I’ve always loved this song and it’s probably my favorite tune from The Zombies. Yes, I know it’s also the obvious choice. I really love this rendition. I think I probably like the studio version better, but it’s pretty close. There are some changes in terms of the arrangement, but the tone and mood are captured perfectly and the vocals are right on target. The killer keyboard solo is intact here. There is an extended jam on this piece that’s classic. Here is another pretty straightforward and accessible rocker with a lot of classic sounds in it. It’s a good one, but not really one of the highlights. There is, though, a smoking hot instrumental section in the middle of the track, but it’s pretty short. This bouncy pop rock number really feels like a lot of the more soft rock from the 1960s, like the Association with some 50s vocal stylings in the midst of that. It’s OK, but not really my kind of thing. Here’s another straightforward rocker. This is slower and has a bit of a gospel or blues edge to it. The vocal arrangement really steals the show in a lot of ways. It’s a step up from the previous tune, but not really one of the highlights here. It has its moments, but seems to go on a bit too long at times. I’d have to say it’s another that shows off some of that sound that might have influenced Queen.